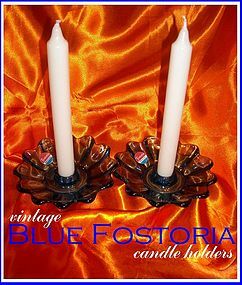 This pair of Blue Fostoria Celestial candleholders is absolutely exquisite. The original Fostoria stickers remain on the items, but the original packaging is not including. They are free from chips, cracks, & other flaws. The Fostoria Glass Company manufactured pressed, blown and hand-molded glassware and tableware for almost 90 years. It began operations in Fostoria, Ohio, USA, on December 15, 1887, on free land donated by the townspeople. When natural resources declined in Fostoria, the company moved to Moundsville, West Virginia, in 1891. Fostoria built a furnace in 1891 that could fire 14 pieces of glass at a time, considered exemplary for the period. During the early years of 1887 through 1909, Fostoria advertised that it manufactured "tableware, colognes, stationers' glassware and candelabra", as well as inkwells, sponge cups, vases, fingerbowls and fruit jars. Many of the stemware designs were needle etched or wheel cut, popular styles during the early 20th century. By 1925, five additional furnaces were added and the company was in its heydey, manufacturing stemware, container glass, and decorative lamps, before adding a colored stemware and dinnerware product line. Fostoria struggled through the Great Depression and World War II, but survived, producing milk glass and depression ware, and the notable patterns of Chintz (1940), Colony (1940), Romance (1942), and Holly (1942). Production peaked in 1950 when Fostoria manufactured over 8 million pieces of glass and crystal. The company expanded in the 1950s, adding the crystal patterns Century (1950), Rose (1951), Wedding Ring (1953), and Jamestown (1959). In the 1960s and 1970s, the company's marketing campaign expanded to include boutiques and display rooms within jewelry and department stores. In addition, Fostoria published its own consumer direct magazine, "Creating with Crystal" during this period. All U.S. Presidents from Dwight D. Eisenhower through Ronald Reagan ordered glassware from Fostoria. Foreign competition increased during the 1970s. In 1983, Fostoria sold its factory to Lancaster Colony Corporation of Columbus, Ohio. By 1986, Lancaster Colony closed the factory and sold the remaining stock directly to consumers. Fostoria's best-selling pattern was American, introduced in 1915. After the factory closure, Lancaster Colony contracted with Dalzell Viking Glass Company of New Martinsville, West Virginia, to continue manufacturing some Fostoria patterns, including American. Thereafter, L.E. Smith Glass Company of Mount Pleasant, Pennsylvania, bought the American molds. Fostoria stemware and dinnerware continue to be popular collector items, with colored pieces valued higher than clear ones of the same pattern. Earlier American pieces are more valuable than later ones. The Anna B. Smith House in Moundsville was purchased by the Fostoria Glass Society of America and turned into a Fostoria museum in 1990.